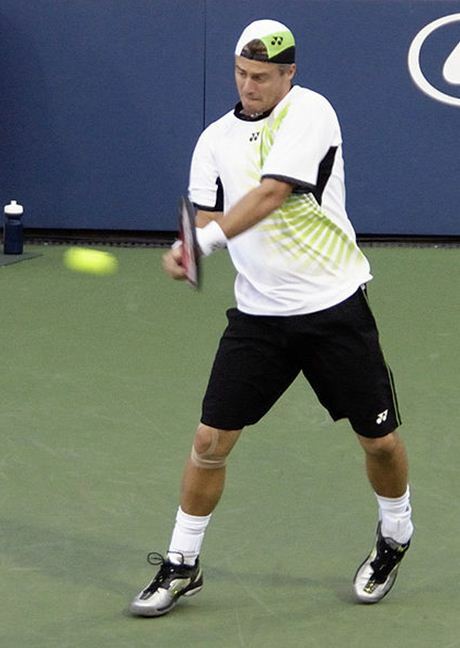 Russia’s Mikhail Youzhny has defeated former champion Lleyton Hewitt in the fourth round of the US Open. In five sets lasting just two minutes shy of four hours, Youzhny wore down the Australian 6-3 3-6 6-7 (3/7) 6-4 7-5. Hewitt missed his a chance to wrap up the match leading 4-1 in the fourth set and was broken as he was serving for the match at 5-3 in the decider. Youzhny managed to wind up the last five games to lock in his position in the quarter-final with Novak Djokovic. After the match Hewitt was unable to say if he would be at the next US Open admitting that the games has changed since he began playing. “Back then, the way that I moved on the court was pretty good,” Hewitt said. “Obviously the way I counter-punched. The game is always changing as well the whole time. Youzhny was not deterred by the support for Hewitt during the match. “The crowd wasn’t against me but for Lleyton. It gave me power to keep coming back. This entry was posted in Tennis and tagged Lleyton Hewitt, Mikhail Youzhny, tennis, US Open on September 4, 2013 by karenunchained. Andy Murray has defeated world number one Novak Djokovic in straight sets 6-4, 7-5, 6-4 to become the first British man to win Wimbledon in 77 years. It was Murray’s second grand slam title to follow on from breakthrough victory at the US Open in 2012. The Scot had the support of the crowd behind him as he served out the match after Djokovic had fought off three championship points. The pair looked to struggle in the 40 degree heat and despite Djokovic’s leads of 4-1 in the second set and 4-2 in the third, he was out-played by Murray with the stats revealing 36 winners to 31, with 21 unforced errors to the Serb’s 40 and 17 break points. “That was one of the toughest moments. Today was an unbelievably tough match,” Murray said in a courtside interview after lifting the trophy. “I have played Novak many times and when everyone finishes playing, he will go down as one of the fighters. Murray felt the pressure from the Nation to perform in front of his home crowd with Fred Perry being the last British man to win at Wimbledon in 1936. “It’s really hard. For the last four or five years, it’s been very, very tough, very stressful, a lot of pressure,” Murray said. “It’s just kind of everywhere you go. “It’s so hard to avoid everything because of how big this event is but also because of the history and no Brit having won. “I think I felt a little bit better this year than I did last year but it’s not easy. A worn looking Djokovic admitted the semi-final epic had taken its toll on his performance at the grand final. “I cannot look for excuses but yes the previous match went almost five hours, five sets,” Djokovic said. “I felt OK but maybe physically I didn’t have enough gas in the important moments. This entry was posted in More Sport, Tennis and tagged Andy Murray, British, Grand Slam, Novak Djokovic, Scottish, tennis, Wimbledon on July 8, 2013 by karenunchained. 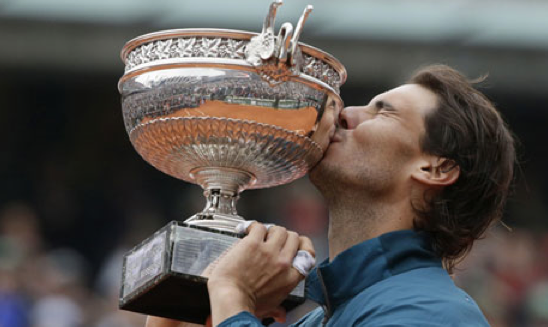 Rafael Nadal has won his record eighth French Open title defeating his fellow Spanish companion David Ferrer in straight-sets 6-3 6-2 6-3. Today’s triumph was Nadal’s 12th career Grand Slam title, which was nothing short of easy with light rain threatening and a court invader in the second set. Fourth seed Ferrer momentarily held the lead in the first set by breaking serve early but Nadal stepped up and claimed two breaks himself and the advantage. Nadal had total control of the second set. He was serving for the set at 5-1 when a shirtless protester invaded the famous clay court wielding a red flare and wearing a white mask. Security quickly apprehended the protester, who got within meters of Nadal. A sight no sports fan wants to see, and brought back memories of when Monica Seles was stabbed in the back by an invader during a Quarter-Final match in Hamburg. Nadal didn’t seem to be bothered all that much by the disruption and closed out the set 6-2. He then appeared to be in a rush to get on with the third set breaking serve right away but his, what looked to be, impatience cost him some unforced errors and was broken back. He regained composure to break back at 5-3 and went on to finish the game in 2 hours and 16 minutes. Rafa now becomes the first man to win the same Grand Slam title eight times ahead of Pete Sampras and Roger Federer who hold seven Wimbledon titles. This entry was posted in More Sport, Tennis, Tennis and tagged David Ferrer, French Open, Grand Slam, Nadal, Pete Sampras, Rafael Nadal, Roger Federer, sports on June 9, 2013 by bradeveleigh. Serena Williams has won her second French Open title defeating the defending Champion Maria Sharapova 6-4 6-4 at Roland Garros. It’s been 11 since her last win on the famous clay courts and this victory is Grand Slam number 16 in total. Sharapova got out to a great start taking a 2-0 lead early in the first set with some precise serving but Williams found her rhythm and fought back with vicious shots down both sides of the court to take a 3-2 lead. The Russian responded leveling the set at 4-4 but Williams took control again and won the set 6-4 in just 51 minutes. Sharapova spent most of the second set trying to save break points and was in trouble down 4-2. 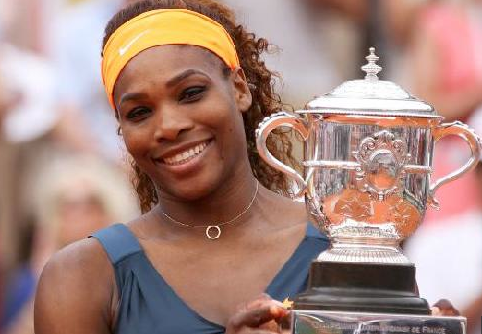 Williams served out the set with a barrage of Aces for the straight-sets victory. The American was the strong favourite heading into the final having won 13 times and losing just twice against Sharapova. Williams only dropped one set heading into the matchup taking her winning streak to 31, which is a career best for her. Serena is now just two Grand Slam victories short of Martina Navratilova and Chris Evert who are tied for fourth on the all-time winners board. This entry was posted in More Sport, Tennis, Tennis and tagged French Open, Grand Slam, Maria Sharapova, Serena Williams, Sharapova, sports, tennis, William on June 9, 2013 by bradeveleigh.